Diligent and detailed as always – and heroically committed, given that it sounds like you didn’t enjoy the record much. Based on the intro to ‘Firth of Fifth’, I would say that Tony Banks is one of the most technically accomplished rock keyboardists ever. I wonder what he made of the scene in 1980, with its two-finger synth basslines and sparse, metallic soundscapes. All that wintry post-punk stuff clearly wasn’t going away; the snow falling on the pastoral fields of prog was going to settle. 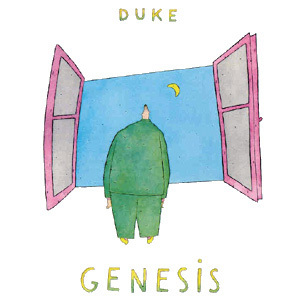 Like countless other prodigiously talented but abruptly irrelevant 70s acts, Genesis somehow had to renew themselves to get any sort of foothold – yet they couldn’t afford to jettison their existing fanbases. At this stage, all the ingredients are here – Collins’ soulboy competence, Rutherford’s simplistic hooks, Banks’ fearsome musicianship. However, as you note, they’re locked in silos, each strand manifesting on discrete tracks. Once they learned to fuse these elements, the power went up a notch (e.g. ‘Mama’). The exception here. as you say, is 'Turn It On Again', although much of its punch is due to the sheer unexpected energy of the performance. But that still doesn't address the weird dissociative void at the heart of the music, which you highlight. The graphic makeover can’t hide the fact that this is a band with not much to say – and in 1980, that’s really not a good look. With Phil now saving the better stuff for solo albums, we’re left with his cast-off breakup whinges, Rutherford’s limply vague ‘political’ sentiments and Banks’ undimmed passion for lyrical fantasy. Really, we’ve not travelled that far from the lyrical personae and word-pictures upon which the group had been predicated in 1968. But even Gabriel himself, for all his sonic adventuring, would not truly drop the mask for another six years. Because of my age when I heard it, I’ve always had a sneaking regard for Collins’ solo stuff. I know it’s bad, but I still like it. So the Rod Stewart comparison hits hard, as you can imagine. Intellectually, though, the point is incontestable. He’s right up there with Supertramp and Level 42 as a perfect car-stereo pick for people who don’t like music.